Hans Heysen was born in Hamburg and came to Australia with his parents in 1883. He studied in Adelaide under James Ashton, 1895 and Harry Gill, 1898 and under Jean Paul Laurens, Benjamin Constant and Leon Bonnat in Paris from 1899-1901. In 1908 Heysen settled at Hahndorf in South Australia and following his first exhibition in Melbourne that year established himself as a major painter of landscape, winning the Gallery's Wynne Prize for landscape nine times. There are very few etchings by Heysen, of which this is one of the best known. He first made etchings while studying in Europe 1899-1904, or shortly after he returned, and again 1910-11. 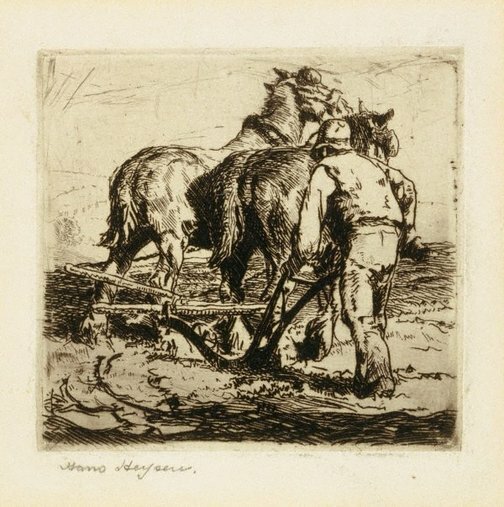 The drawing for this etching on a sheet of studies of a man ploughing with a two horse team, in the collection of the Art Gallery of South Australia. The study and etching are about the same size. A larger, fully developed charcoal drawing of the same subject was made after the etching and the Wynne Prize winning watercolour 'The toilers' in 1920. The two draught horses in these works are Polly and Jack, who were regularly brought in to plough and cultivate the soil at Heysen's property 'The Cedars' at Hahndorf. Another watercolour of them ploughing is in the Gallery's collection. Heysen was able to proof his etchings on his lithographic press, but the edition was printed by Lionel Lindsay, who encouraged Heysen to etch. 'Turning the plough' was included in the first exhibition of the Painter-Etchers Society in 1921, from which it was purchased by the Gallery. Signed l.l., pencil "Hans Heysen.". Not dated.